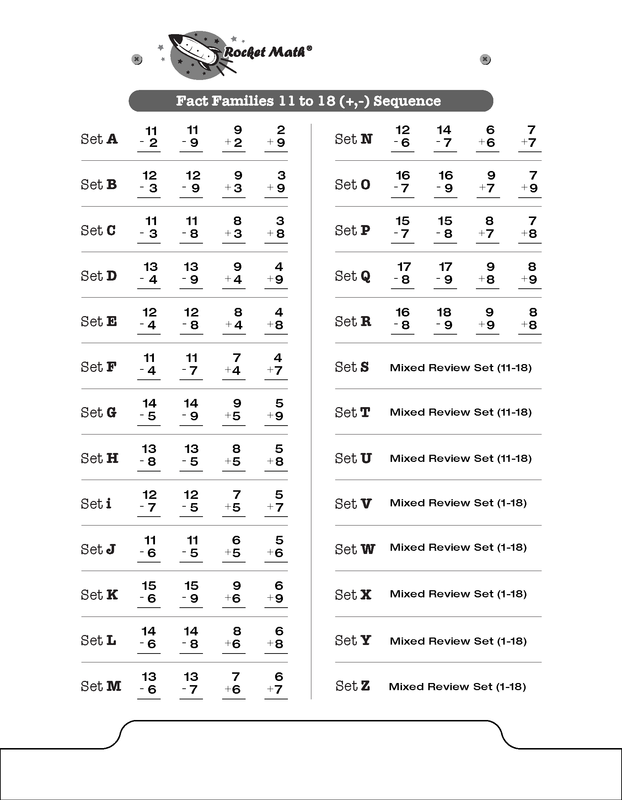 Learn Fact Families to fluency with Rocket Math! 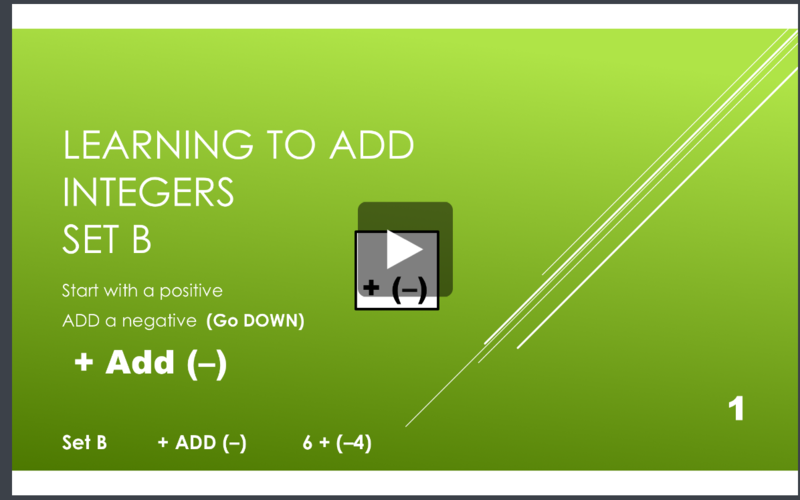 You may be interested in a webinar Dr. Don did recently with the folks at the Educational App Store in the U.K. We discussed what is needed for children to have success in math–learning math facts to automaticity. We also talked about how best to help children learn facts and therefore what is needed in an app to achieve that learning. 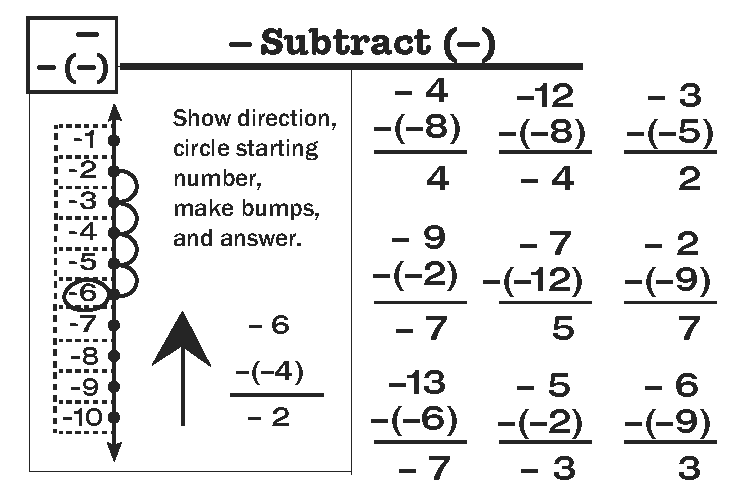 What are math facts and why are they important for future math success. What happens when students haven’t memorized math facts. 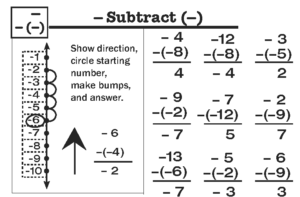 How can you best help students learn math facts. Webinar with Dr. Don: How to Prepare students for math success. On Thursday May 3rd, the Educational App Store is hosting a seminar with Dr. Don, “How to prepare students for math success.” Pacific time will be 8:30 AM, Eastern time 12:30 PM and London time will be 4:30 PM . 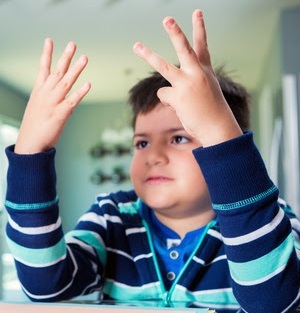 This 30-minute webinar focuses on the importance for future math success of developing fluency and automaticity with math facts and how to help students achieve it. 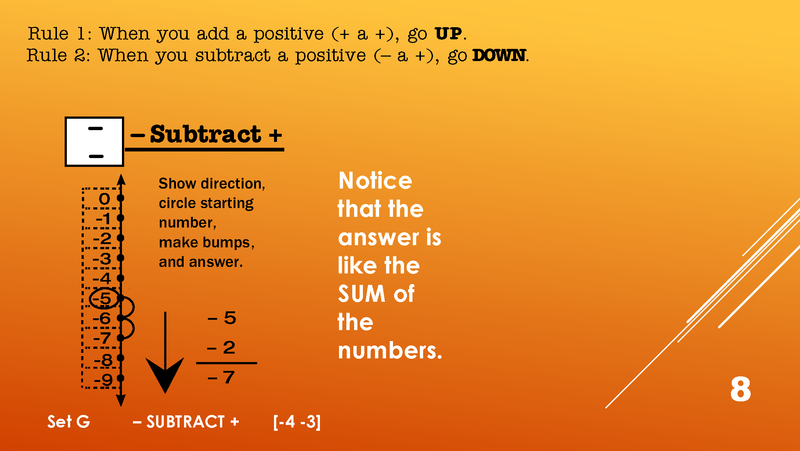 Sometimes students need to review test problems also. You know that there is a difference between the test problems and the practice problems, right? The problems practiced around the outside are the recently introduced facts. The problems inside the test box are an even mix of all the problems taught so far. Sometimes students have forgotten some of the older facts. For example, if there has been a break for a week or more, or if the student has been stuck for a couple of weeks, the student may have forgotten some of the facts from earlier and may need a review of the test problems. How you could diagnose for this problem. 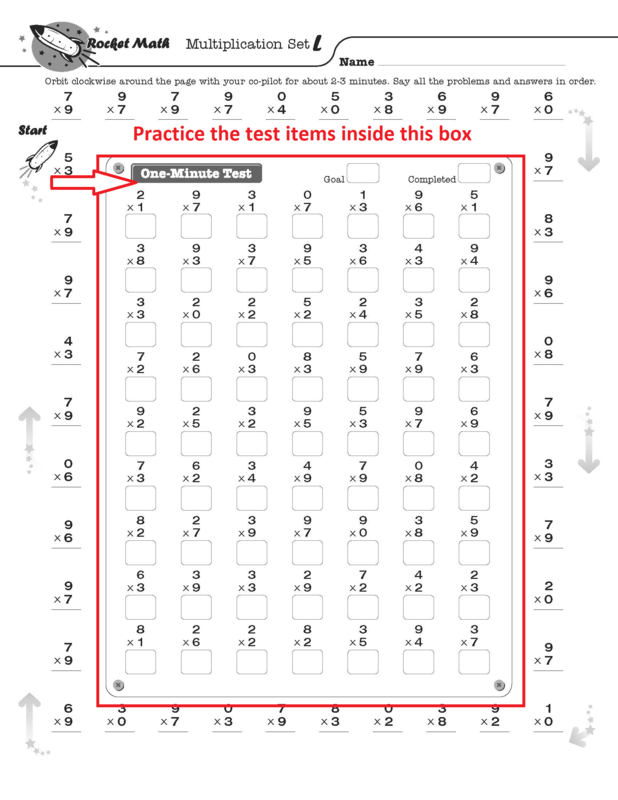 Have the student practice orally on the test problems inside the box with you. If the student hesitates on several of the problems that aren’t on the outside practice, then the student needs to review the test items. Solution. 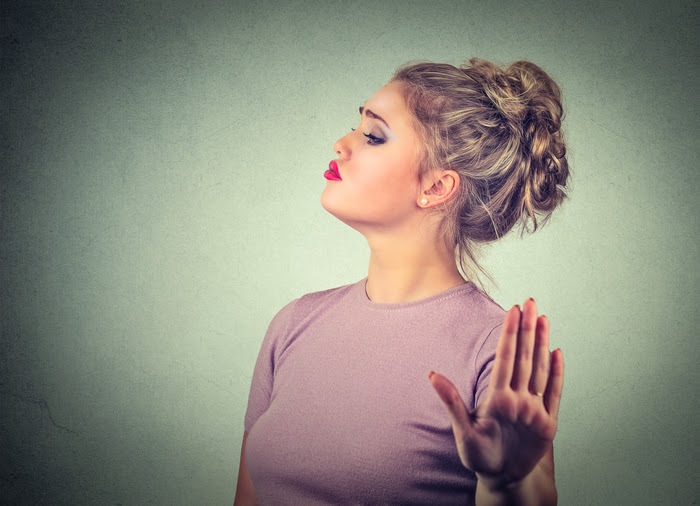 If you have this problem with quite a few students (for example after summer break or after Christmas break) then have the whole class do this solution. 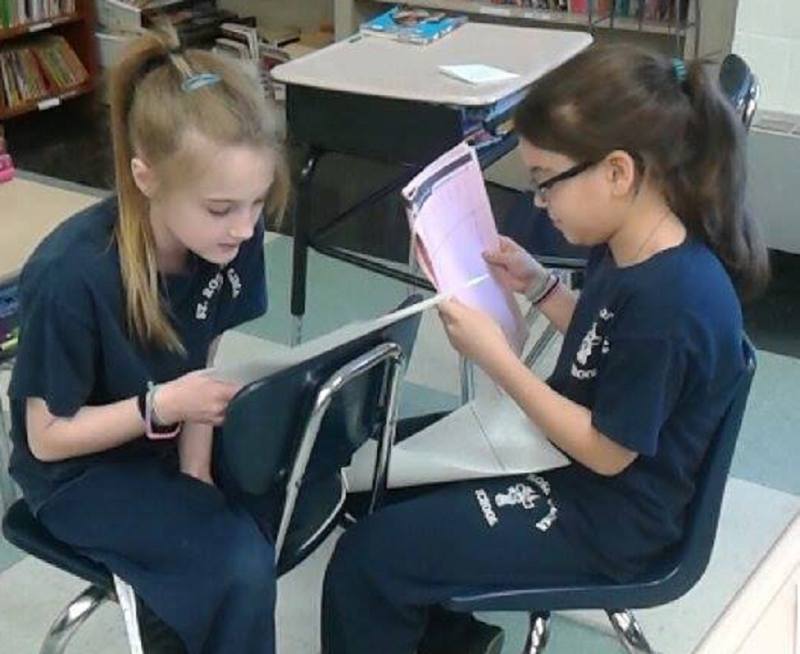 For the next week, after practicing around the outside, instead of taking the 1 minute test in writing, have students practice the test problems orally with each other. Use the same procedures as during the practice—two or three minutes with answer keys for the test, saying the problem and the answer aloud, correction procedures for hesitations, correct by saying the problem and answer three times, then going back—then switch roles. 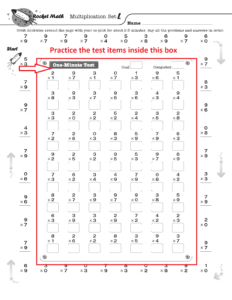 Do this for a week and then give the one-minute test. Just about everyone should pass at that point. Why give the Two-Minute timings in Rocket Math? To prove whether students are making progress in learning math facts. First of all, understand that the two-minute timings are NOT a teaching tool. They are an assessment tool only. Giving a two-minute timing of all the facts in an operation every week or two allows you to graph student performance. 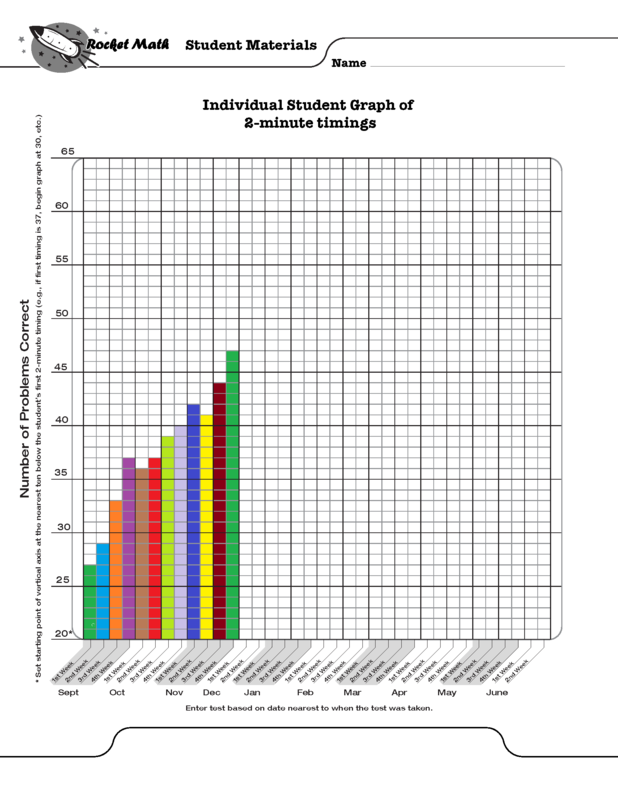 You graph student performance to see if it is improving. If the graph is going up, as in the picture above, then the student is learning. If the graph is flat, then the student is not really learning. The individual graphs should be colored in by students allowing them to savor the evidence of their learning. The graphs should be shared with parents at conference time to prove that students are learning. Progress monitoring with two-minute tests are a curriculum-free method of evaluating a curriculum. If you use the same tests you can compare two methods of learning facts to see which one causes faster growth. This makes for a valid research study. This kind of progress monitoring over time is also used in IEPs. You can draw an aimline from the starting performance on the two-minute timing to the level you expect the student to achieve by the end of the year. (Note the writing speed test gave you goals for the two-minute timing which you could use for your end-of-year goal.) The aimline on the graph, when it crosses the ending date of each quarter, will provide quarterly objectives that will enable quarterly evaluation of progress–required for an IEP. 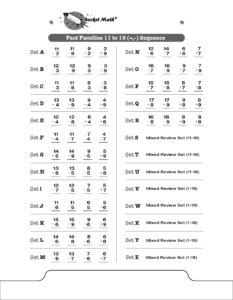 These two minute timings are a scientifically valid method of proving whether students are learning math facts, in the same way that tests of oral reading fluency prove whether students are learning to read. 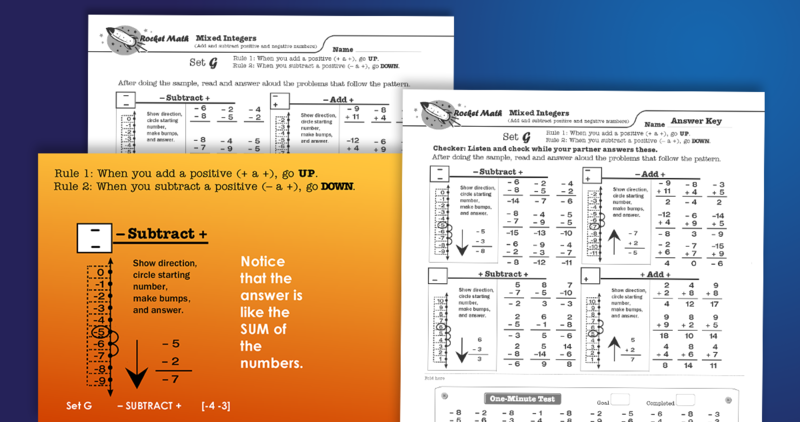 They can be used to prove to a principal or a curriculum director, for example, that Rocket Math is working and is worth the time, paper and money it requires. 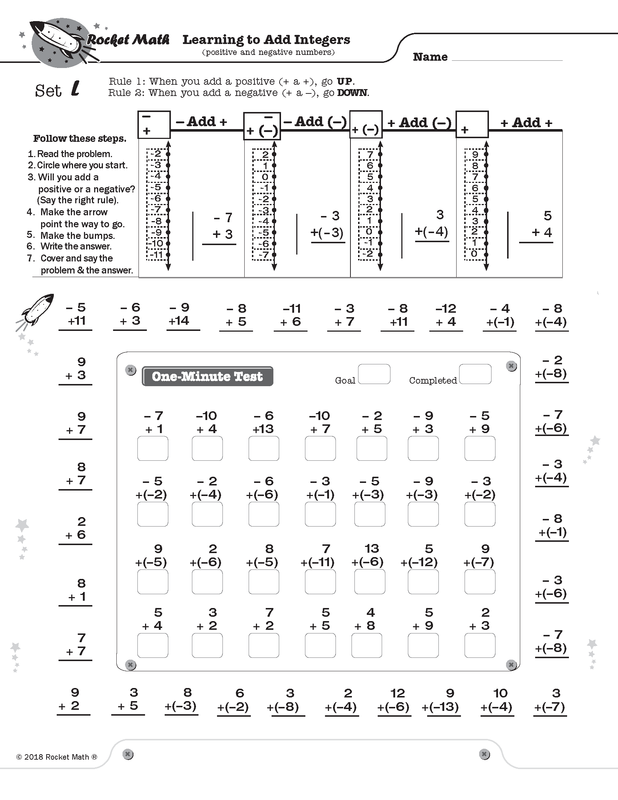 What is the Rocket Math paper-and-pencil program? 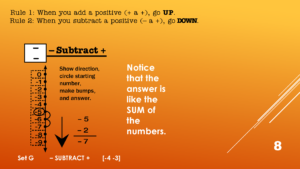 Here is a link to a quick, one-minute explanation of the paper-and-pencil version of Rocket Math.